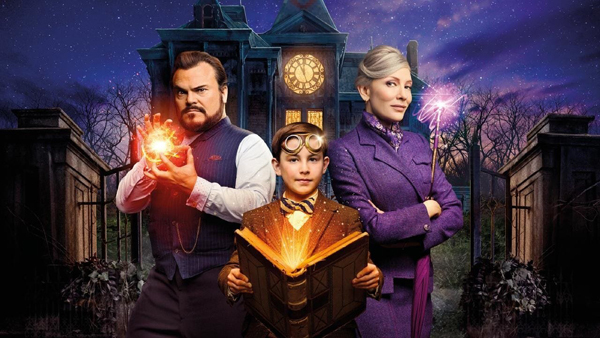 Jack Black and Cate Blanchett star in "The House with a Clock in Its Walls," a paranormal fantasy directed by Eli Roth ("Death Wish"), about an orphaned by who moves in with his uncle, who is a warlock. Along with their neighbor, a witch with a mysterious past, they investigate a mysterious clock that was built with ominous intentions. Based on the novel by John Bellairs, "The House with a Clock in Its Walls" co-stars Owen Vaccaro ("Daddy's Home 2") and Kyle MacLachlan. In his review of "The House with a Clock in Its Walls" at The Wrap, William Bibbiani says that Eli Roth's film "falls short of Halloween classic territory, but not by much," and argues that despite some narrative hiccups, it's "easily Eli Roth's best motion picture."